Learn how to make taco meat to tuck away in your freezer for those nights you don’t want to cook! 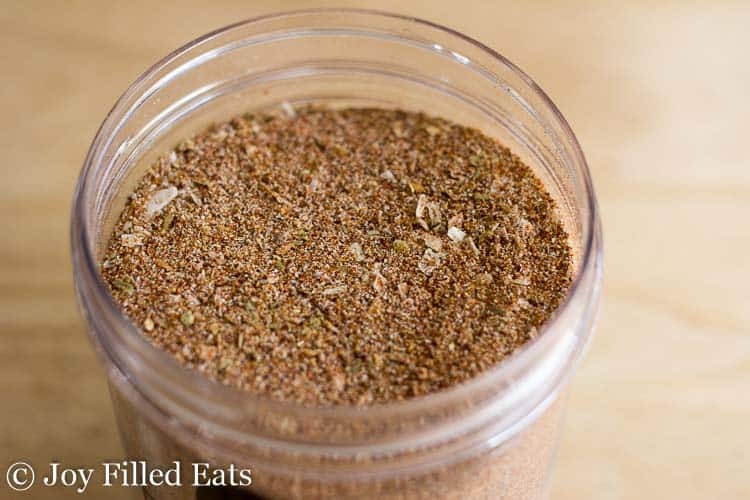 I will show you how to make taco seasoning at home, that will flavor your meat to perfection! I will be honest, I love spending time in the kitchen, but I do have days where I can barely muster up the energy to cook. On those nights I reach in my freezer for my taco meat I made and whipped up quick ground turkey tacos with all our favorite fixings. Just warm the meat up, set out the fixings, and let each member pile on and create their own version of a taco! Keeping prepared taco meat in the freezer at all times has made my life as a mom so much easier. On nights I don’t feel like cooking I can just heat up some taco meat. It doesn’t hurt that my kids jump for joy when they hear we are having tacos. I take a few extra minutes and make my taco seasoning. 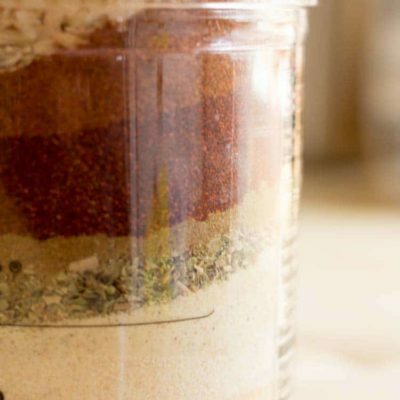 With a handful of spices and herbs, you can make an incredible taco seasoning that you know what is precisely in it. No fillers or preservatives, just herbs, and spices. 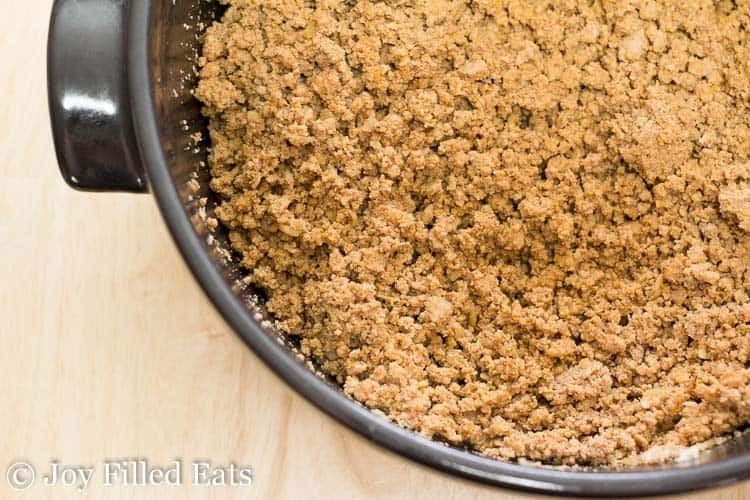 The flavor you get from homemade taco seasoning shines brightly compared to packet seasoning! And if you have all the spices on hand, you can make a second batch of seasoning and place in a sealable bag for future use. You are welcome to use whatever protein you prefer. We enjoy a leaner mix so we often reach for ground turkey. But you can do ground beef, turkey, or even chicken. I have on occasion mixed turkey and beef together, and it tasted good as well. Simply grab a large pot with a lid, and place all your ground meat in the pan. On medium-high heat, you want to cook your ground turkey, so it is getting broken up. I find that a potato masher is a great way to break up the meat into smaller pieces, so it stretches the meat. This has been one of my go-to easy dinners for the last few years. I buy a massive pack of ground turkey from Costco (about 6 pounds) and cook it all at once and season for tacos. When it is done, I divide it into dinner size portions. For taco night we use about 1 pound of meat for two adults and three kids (the 4th prefers her tacos meatless and my toddler doesn’t like Mexican food at all – he’s an Italian baby all the way). I use some that night for taco night and freeze the rest. 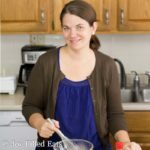 My husband and I usually make big taco salad, but occasionally we use low carb tortillas. Our favorite fixings are cheddar cheese, sour cream, salsa, chunks of avocado or guacamole, lettuce, tomato, and cilantro. What I do is reach for freezer bags, and place meat in bags. I try to add around one pound of meat per bag, so I know that is a meal’s worth of meat. You can size as small or large as you want. Then toss in the freezer and use within 2 months. To thaw your meat just place in the fridge the night before, and then toss into a pan. I add a splash of water to help add moisture back into the meat if it is looking dry. Heat it until it is warmed all the way through, and then serve how you would like. Absolutely not! If you have a large family or are entertaining, make and serve right away if you would like. There is no need to meal prep for future meals; I just go this route to save me time later down the line. But, if you have a group coming over and want taco meat now, go for it. Want to know how to make taco meat for a smaller crew? 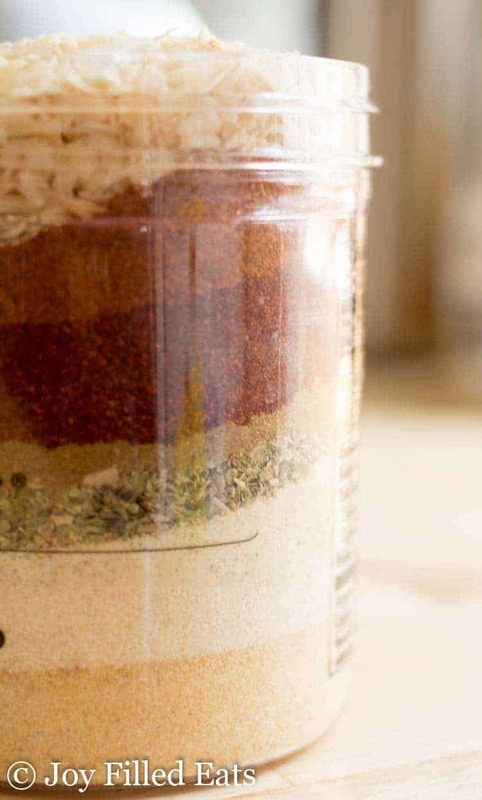 Simply mix up my homemade taco seasoning but only use 2 tablespoons per pound of meat. Then any time you want tacos you just need to cook the meat and add the seasoning. Looking for some inspiration that is beyond straight tacos? 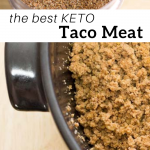 Let me share some of my favorite recipes that use taco meat. You could easily pull a package of meat from the freezer to use, instead of making fresh meat for the dish! This pre-meal prep will save you a lot of time the day of cooking, which I will never complain about that. Taco Salad Casserole – You could easily swap the meat with this taco meat, and leave off the seasonings since your meat is pre-seasoned already. Layered Taco Dip – Just grab your meat and leave the meat and taco seasoning out of the recipe, then assemble as you directed. Taco Empanadas – With premade taco meat these come together in a snap! Using taco meat doesn’t have to be complicated. We also just put a scoop on a low carb tortilla with baby spinach or lettuce, cheddar cheese, and sour cream and call it a night! 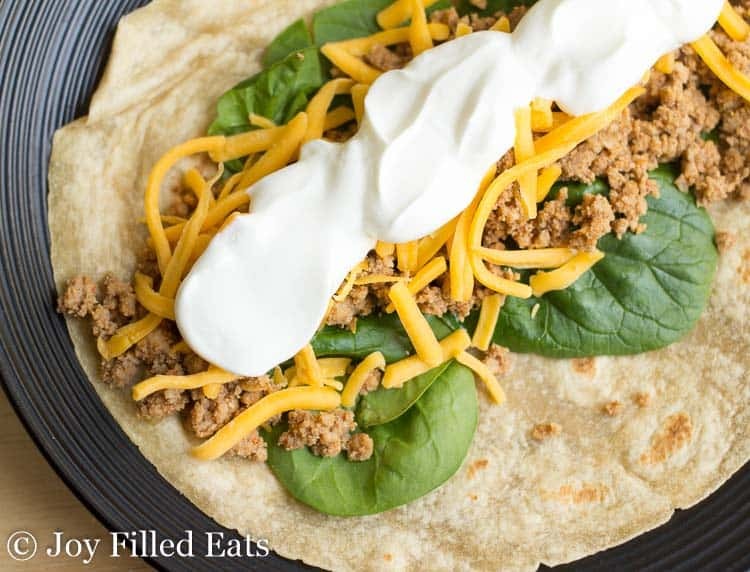 I have so many Tex-Mex inspired recipes on my site, that you could use your ground taco meat for. Taco meat is so versatile, and boy is it delicious. 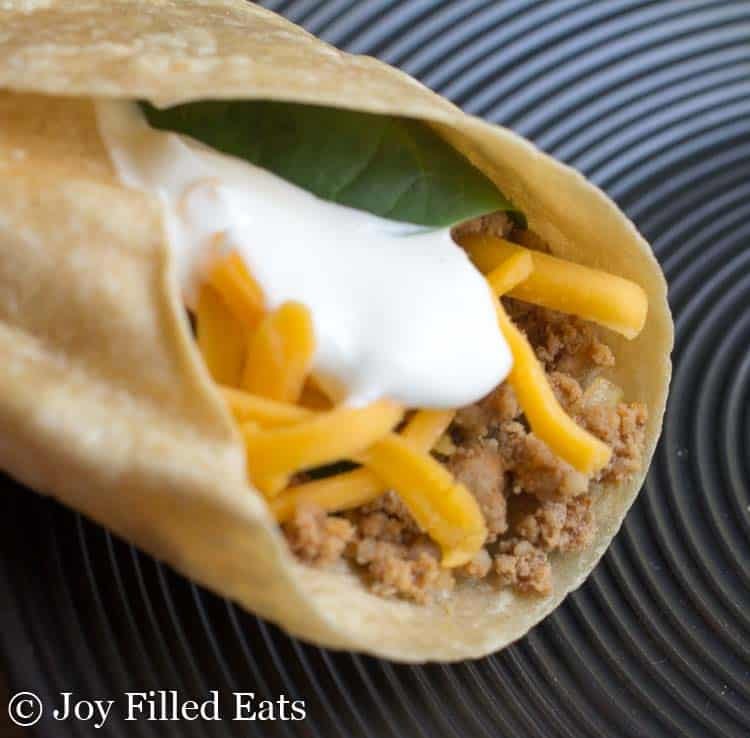 So give this homemade taco meat recipe a try today, and let me know what you think! Learn how to make taco meat to tuck away in your freezer for those nights you don't want to cook! 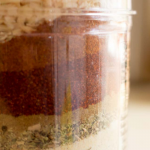 I will show you how to make taco seasoning at home, that will flavor your meat to perfection! Cook the ground meat on medium heat in a large pot with a lid. Every 5-10 min stir the meat and mash it up. I use a potato masher for this and it worked really well. Once all the meat is browned add the seasonings. Stir until well mixed. If you are using some immediately go ahead and have dinner. Cool the remaining meat to room temperature and divide into freezer safe bags or containers. I freeze in one pound portions. That is enough for my family of 6 for dinner because we use tons of taco toppings like avocado, salsa, sour cream. and cheddar on taco night. Freeze until needed. Mix together all the seasonings. Use 2 tablespoons for every one pound of meat. Add more to taste. If you like your tacos spicy add more crushed red pepper. Originally Published May 31, 2016. Revised and Republished March 27, 2019. AWESOME!!! A-MAZING!!! Made 6-lbs and it's so wonderful!! Now I'm making your Mexican Taco Casserole for dinner tonight. Thanks for the great recipes!! Yes, you can just leave it out. My mom hates cumin too. lol. How long does this last in the freezer? Cooked meat should last 2-3 months.